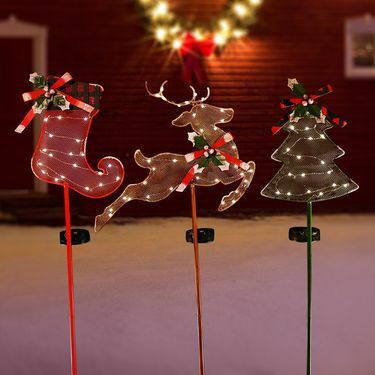 Celebrate the holiday season and bring extra JOY into your garden with this amazing assortment of 3 Solar Christmas Garden Stakes! Enchant your holiday garden visitors with a delightful Solar Reindeer Stake, and festive Red Stocking, and Holiday Tree, all made of metal and holiday cheer. Place them in a pathway, driveway, or any outdoor area that needs a lift of Winter spirit. Adorable throughout the daytime in full color, gathering the natural energy of the sun, and delivering a nice accented lighted surprise at night with the solar-powered energy saving LED light. Sizes: Reindeer: 12"W x 36"H / Stocking: 9"W x 36"H / Tree: 7" x 35"H.